Some things are just so well-known that they can't be Dutch, right? Or the name sounds even so non-Dutch that they must be from abroad. Well, embrace yourself for ten surprises, as here is our list of ten things that many people don't know they're Dutch. Not only is it Dutch, it's even the most well-known English spoken radio programme on Dutch radio. The Happy Station Show was introduced by Philips on their PCJJ radio station in 1927, and is still running, though currently on a Taiwanese radio station. After WW2, the show moved to Radio Netherlands Worldwide untill 1995, when RNW cancelled the show. In 2009 however, the show returned on the Taiwanese PCJ Radio (yes, named after the former Dutch station!) and it is currently still running. Everybody knows the CD was invented by Philips, but hardly anyone remembers nowadays that so was the compact cassette. Probably because very few people still use these things. Yet it turned out revolutionary for the music industry. After all, "free music" became suddenly available for everybody, as suddenly everybody started to record their own mixtapes with music from the radio, rather than buying a record in the store. Hence, indirectly, we contributed to the invention of music piracy. 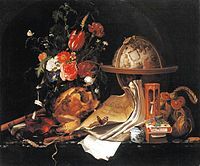 Now obviously, we weren't the first painting still life. Still life painting exists for as long as painting exists. 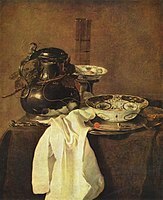 However, it were Dutch artists who started making series of still life paintings and hence made it a distinct genre and professional specialization. Or according to Wikipedia anyway. They're actually not supposed to be orange. Carrots were originally black, red, yellow or purple by nature. Orange coloured carrots were invented by a group of farmers from Hoorn, who cross-bred yellow carrots with red ones. Some early form of gen tech, you could say. Claims are the colour orange was chosen to honour the House of Orange, though the fact that the orange carrot tastes somewhat sweeter might have something to do with it as well. Another nature-hack, this time by farmers from the eastern Gelderland village of Elst, where the apple was named after. The Elstar isn't even that old yet, "invented" in 1950. Often used for the production of apple sauce, but also very nice to eat as a healthy snack. We all know the Bosatlas from school. A book with maps and demographics of different places. The very first atlas widely published was the Atlas Novus, published by Amsterdammer Willem Blaeu in 1635. But even before him, Abraham Ortellius is commonly recognised to write the very first atlas in 1548. Now this might raise some discussion on whether or not the Atlas is actually a Dutch invention, as Abraham Ortellius was in fact born in Antwerp, which was the Netherlands back in those days but is currently part of Belgium. However, since he personally never knew Belgium, we'll consider him Dutch for now. Chances are you are using it now, since Wi-Fi widely replaced cables for connecting computers with routers and hence the internet. But Wi-Fi also enabled other, smaller devices to connect to one's home network, such as phones, portable internet radios and MP3-players. Imagine having to connect an ethernet cable to your iPad Nano. Wi-Fi however was invented long before it became widely available, just like the internet itself for that matter. In 1991, Vic Hayes invented the precursor to 802.11 when he worked for the Nieuwegein-based NRC Corporation. This IEEE 802.11 is what is called Wi-Fi today, though technically Wi-Fi is actually a brand name. WLAN is a more general name for IEEE 802.11. Many of us may never have heard of these, but they are two important Unix-components. Python is a programming language invented by Guido van Rossum in 1989. It is used by many large organizations such as Google, Yahoo, CERN and NASA. Vim is a plain text editor written by Bram Moolenaar in 1991. Where Windows-users are stuck with Notepad, Linux users have Vim, which automatically highlights code and shows errors. It is rated the most popular plain text editor among Linux users. Look at it! Such an adorable, heavily obese bunny! This ten-minute cartoon triggers both empathy and laughter. Who came up with such a fantastic story? Well, Sacha Goedegebure did. Mainly to promote Blender, which is free software to create such animations, and which by the way is also Dutch. But seriously, they should have given Buck his own TV-show. Many people think this to be American, but capitalism is actually a Dutch invention. "The United Provinces of the Netherlands were the land in which the capitalist spirit for the first time attained its fullest maturity", according to Wikipedia. So next time you complain about capitalism or the free-market economy, just remember: we have ourselves to thank for it!